Already one of the cultest names in the metal underground, the diabolical ACID WITCH dig deeper into the cult with four exclusive covers of heavy metal songs from 1980s horror movies! 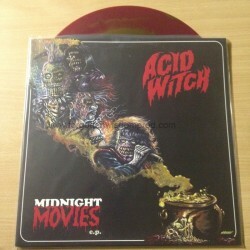 Sorcery's "I'm Back" from Rocktober Blood, Fastway's "After Midnight" from Trick or Treat, Black Roses' "Soldiers of the Night" from Black Roses, and 45 Grave's "Partytime" from The Return of the Living Dead - all get ACID WITCH's signature ghoulish touch, and it's the touch of true horror! You're never gonna find a more perfect combination than here on Midnight Movies!